A sign is taped on the window of a counter set up by archeologists who are denouncing a decrease in research fundings on February 5, 2015 at the Louvre Museum in Paris. AFP PHOTO / BERTRAND GUAY. PARIS (AFP).- French archaeologists protesting the privatisation of their profession gave visitors free entry to the renowned Louvre museum in Paris Thursday. Visitors, who normally pay 12 euros ($13) to see the Louvre's collection of masterpieces, were therefore allowed to enter the museum for free, he said. 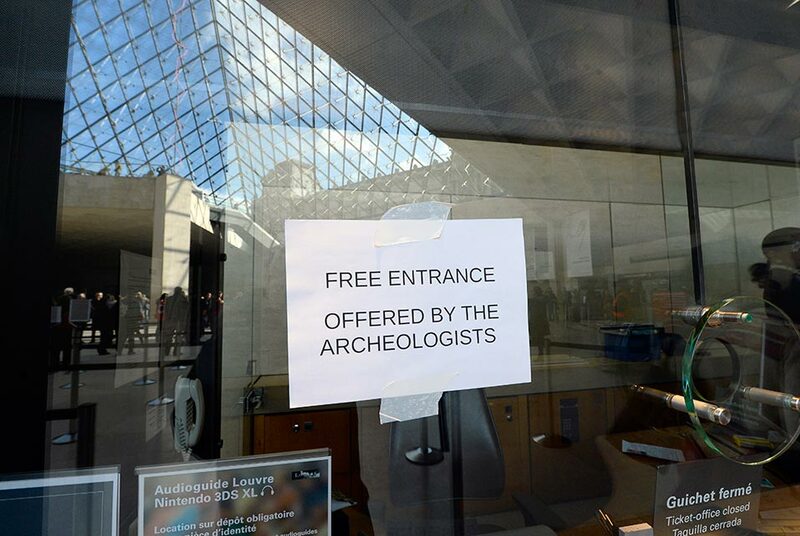 A sign posted on a ticket counter window read: "Free entrance offered by the archaeologists". The protesters denounced "the threats to the protection of archaeological heritage sites." "For more than 10 years, the privatisation and commercialisation of this sector has led to a catastrophic situation," said a group of unions in a statement. They focused on a sector called "preventive archaeology," which helps protect ancient sites, and which was opened up to competition from private companies in 2003. A spokesman for the culture ministry said it was "astonished" the protesters had allowed the Louvre to "suffer the consequences" of their demonstration and was in talks with the unions over the issue. The Louvre, one of the most popular attractions in the French capital, is also the most visited museum in the world, receiving 9.3 million visitors in 2014.